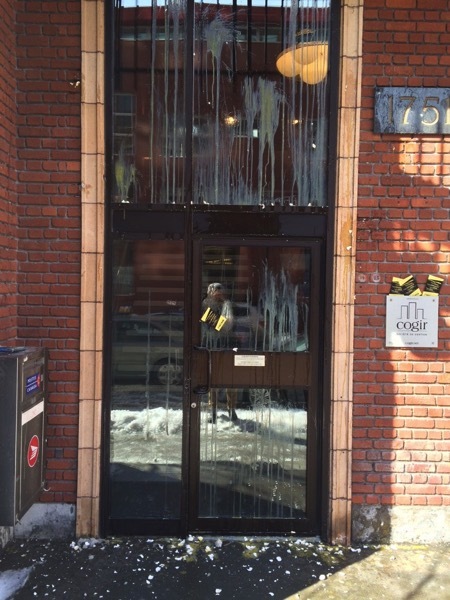 Taxi drivers in Montreal made it clear yesterday their fight against Uber will not be over easy, as they upped their protest by egging Uber cars and offices, leaving them scrambling for cover, reports the National Post. Tensions boiled over and cracked when hundreds of taxi drivers protested in downtown Montreal, parking their taxis along Sherbrooke and René-Lévesque Blvd at rush hour to demand the Quebec government intervene against Uber, while also calling for Premier Philippe Couillard to resign. As taxi drivers spotted two UberX cars during their protest, a plan was hatched to pelt cars with eggs. CBC News reports at one point, taxi drivers lured UberX drivers to the protest site by hailing them through the company’s smartphone app. When one driver showed up, he was ambushed with snowballs and eggs, with one hitting him in the face. Uber’s Montreal offices were also targeted around lunchtime, as drivers parked their vehicles blocking off Richardson Street, honking horns and blowing air horns. This is when some started throwing a couple dozen eggs at the office, splashing doors over hard. One taxi driver with a megaphone yelled “Uber, this is our first friendly warning,” despite employees coming outside pleading with the group to stop. Montreal police monitored the situation but did not intervene. Security guards locked office doors from the inside. Kattoua claims Uber has resulted in a 50 per cent decline in his business and his taxi permits have plummeted in value about $50,000 to $60,000, as UberX poaches his earnings. “The mayor of Montreal sends a message to Uber to stop their service and they don’t even listen. We live in a banana republic. Uber spokesperson Jean-Christophe de Le Rue, condemned Wednesday’s actions by taxi drivers saying “We strongly condemn the violence and intimidation tactics used today by members of the taxi industry,” adding “The government has put in place a commission to hear the views of stakeholders and we believe that the best path forward will be found through dialogue, not violence.” The commission hopes to find a sunny side to the tense situation. Just over a week ago, Montreal taxi drivers protested at the Pierre Elliott Trudeau Airport, as part of their “Uber hunt” against the ridesharing company. Not sure what these taxi drivers are thinking, but throwing eggs won’t get the public to support you and understand the yolk of the matter. Time to hire a PR firm to nest up dozens of different strategies instead.